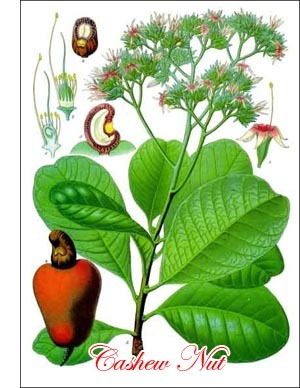 The Cashew nut is borne on a tree 30 to 40 feet high, native of the West Indies, and known to botanists as Anacardium occidentale. It is now cultivated throughout the Tropics. The parts of the fruit are rather anomalous in their structure and arrangement. The swollen stalk of the fruit is known as the Cashew apple and is used for preserves. The Cashew apple has an acid astringent flavor and is 2 to 4 inches long. The kidney-shaped nut, about 1 inch long, is borne at the tip of the Cashew apple. The nut is commonly roasted and used as a flavoring material in confectionery and for other purposes. An intoxicating drink, known as kaju, is made by fermenting the Cashew apple. All parts of the fruit are used for medical purposes. The Cashew nut thrives in the dry districts of tropical countries and near sea level.